If you think it is taking a long time to get a lock on your location when using our mobile application, it may be due to your device’s GPS settings. We recommend setting it to High Accuracy. *You may have to tap the Location twice to get the additional settings. If it is set to Power Saving, it will use wifi and mobile networks to find your location but not the GPS signal. If it is set to GPS only, it will take longer for it to get a “lock” on your location. Using “High Accuracy” uses all possible location information to speed up the location “lock”. 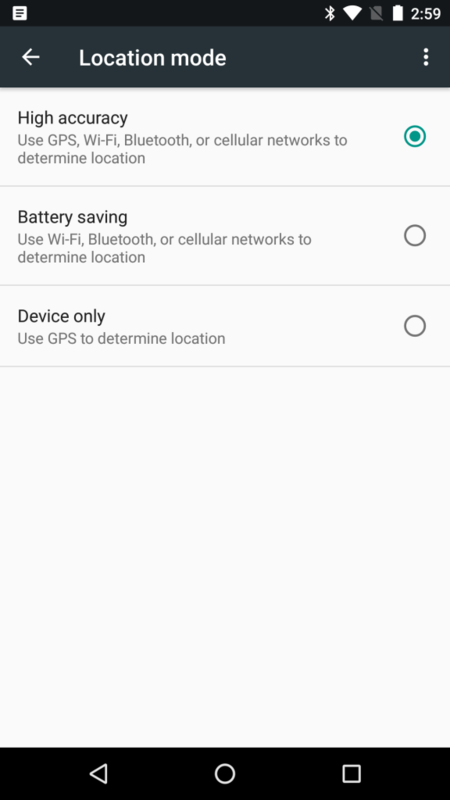 The exact location of this setting will vary from model to model and version of Android OS. You may have to consult your device’s documentation. Some Android phones will need to have their Assisted-GPS (AGPS) data reset to help speed up future GPS lock. Install the free app GPS Test from the Google Play Store. It’s a free app that you can later uninstall. 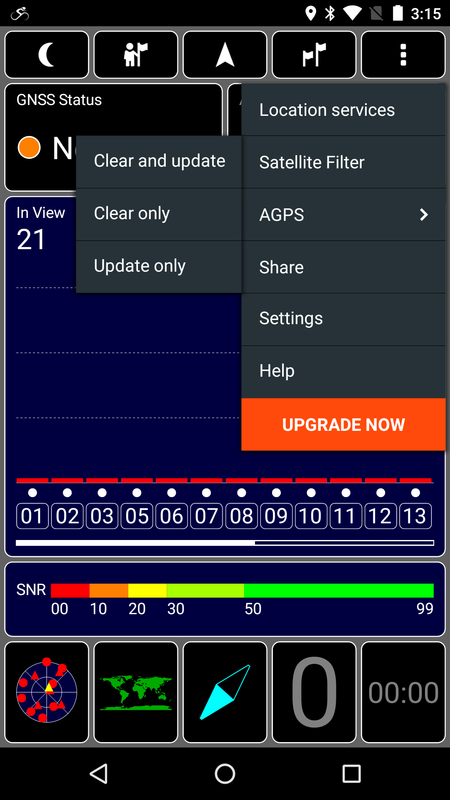 After “GPS Test” is installed, tap the menu icon ( ) in the upper right corner then tap CLEAR AGPS. Tap the menu icon ( ) again, this time tap UPDATE AGPS. This forces the phone to re-locate itself with new satellite locks and local area network. This works best while outside or near a window. Let the phone lock onto satellites without moving for about 10-15 minutes. The more direct clear sky you can see the better this will work for accuracy. If you go out then back into GPS Test, the satellite lock should be very quick. Now, go back into the Ride with GPS app. Tap GO RIDE. The app should now show your current location on the map with a blue dot. Tap the crosshairs icon in the upper right corner to center the map on your location. The frequency in which these steps must taken varies from model to model. With thousands of available Android models on today’s market it is simply impractical for us to supply a complete list of Android phones that would benefit from these steps. We only provide these steps as a troubleshooting tool to help get you back on the road as soon as possible.